OXFORD, Miss. – The University of Mississippi Libraries’ Department of Archives and Special Collections will feature guest speakers on a variety of topics during its Fall Lecture Series. The series run through November. Each lecture will be held at noon in the Department of Archives and Special Collections, on the third floor of the J.D. Williams Library. All programs are free and open to the public. Guests are welcome to bring a brown bag lunch to the events. For more information, contact Ford at jwford@olemiss.edu or 662-915-7408. Sept. 21 – “Mississippi in the Work of Sherwood Bonner.” Katie McKee, UM associate professor of Southern studies and English, will discuss Sherwood Bonner, a 19th century literary figure from Mississippi who is the subject of McKee’s forthcoming monograph. Sept. 28 – “Tracking RFK Through the Delta: Digging Through Documents and Knocking on Doors.” Ellen Meacham, UM instructional assistant professor of journalism, will discuss her research for the upcoming work “Delta Epiphany: RFK in Mississippi,” which focuses on Robert F. Kennedy’s historic trip to the Mississippi Delta. Oct. 5 – “We Believed We Were Immortal.” UM journalism professor Kathleen Wickham will discuss her new book, “We Believed We Were Immortal: Twelve Reporters Who Covered the 1962 Integration Crisis at Ole Miss.” Wickham will discuss her research, which focuses on the work of 12 journalists during that time and the unsolved murder of French reporter Paul Guihard. 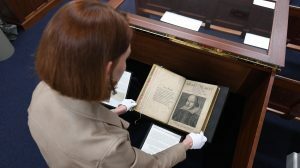 Oct. 10 – “From Shakespeare’s London to Faulkner’s Oxford: The Unlikely Journey of Edwin Booth’s Second Folio.” UM theatre arts professor Rhona Justice-Malloy will discuss the acquisition of Shakespeare’s Second Folio by the university. The acquisition of the folio, owned by actor Edwin Booth, was made possible in 2016 thanks to a donation from the Gertrude Ford Foundation. Oct. 19 – “Mississippi Civil Rights Museum.” Pamela Junior, director of the new Mississippi Civil Rights Museum, will discuss the museum’s exhibits, history and future. Oct. 31 – “The Bell Witch of Mississippi: Slavery and the Supernatural.” Amy Fluker, visiting assistant professor of history, will discuss the folk tale of the Bell Witch and its connections to Mississippi, the supernatural and slavery. Nov. 8 – “Make Me a Hummingbird of Words: Salvos into the Word of Micro-Memoirs with Beth Ann Fennelly.” Mississippi poet laureate and English professor Beth Ann Fennelly hosts this session, part craft talk, part reading. She will share strategies that informed her new book, “Heating & Cooling: 52 Micro-Memoirs.” She crosses genres, combining the brevity of poetry and the truth-telling of nonfiction in her storytelling form. Nov. 15 – “Living, Making, Being: Houses and Craft Production at a 14th Century Native American Village in Southwestern Virginia.” Maureen Meyers, UM assistant professor of sociology and anthropology, will discuss her excavations at the Carter Robinson site over the last decade. The excavation of six houses on 14th century mound and village site has yielded finds such as shell beads and gaming stones. Meyers will talk about households of people who lived at the site, craft production and what recent excavations have revealed.